Cowman, Marie Kuramoto, DJ Blinn and David Hammes are the "Final Four"
The “Final Four” are back! I know when you hear that term, Final Four, your mind must go directly to college basketball, but for us marathoners the Final Four refers to DJ Blinn, David Hammes, Marie Kuramoto and Ken Shirk (Cowman). Those four marathoners are the only ones that have done all 12 previous Big Island International Marathons and they have already sent in their entry fees to run in number 13 to be held on March 21, 2010. Why did they sign up so early, with the race nearly five months away? All four marathoners have taken advantage of the fifty percent discount “Early Bird” entry that is offered each year to people that mail in their applications prior to November 1st. 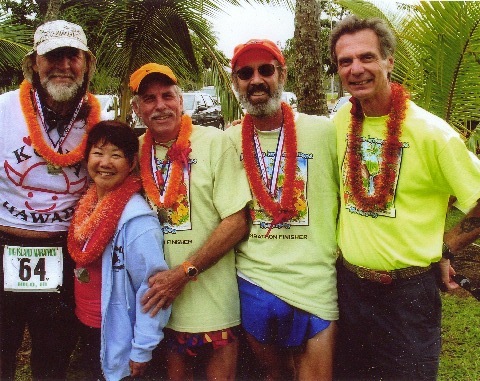 The BIIM (or Hilo Marathon as it is affectionately called) was established in 1997 when businessmen Roland Higashi of Creative Arts and George Miyashiro of Jack’s Tours recruited the help of Karl Kunz and the Big Dog to design and put on a 26.2-mile marathon race. Miyashiro has long since retired and Kunz returned to Thailand to resume an agricultural consultant business leaving Higashi and Big Dog to continue the event into its 13th year. Higashi serves on the BIIM board of directors as its president and the Big Dog, who had ran in the first 8 BII marathons, has been the race director for the past four races. “We’ve seen many changes over the years as we continue to look for ways to improve and enhance one of the most beautiful marathon courses in the world,” Higashi said. Many runners agree with Higashi’s assessment, that this marathon course is one of the most scenic in the world. The marathon, along with a certified half-marathon, begins in Pepeekeo at 6 a.m. The course uses the Scenic 4-mile Route and winds through Papaikou, Honolii, and Wainaku as it makes its way back into Hilo. The half-marathoners will run to the Hilo Hawaiian Hotel and return back to the Bayfront finish line. The marathoners continue out to the Airport, National Guard Armory, and then head out to Richardson Beach Park before heading back to Bayfront while following along the beautiful Hilo coastline. Don’t feel like running a full or half marathon, the BIIM also offers a 5K (3.1-mile) run/walk that starts and ends at Hilo Bayfront. The 5K runners head out to the Ice Ponds, going over the Suisan Bridge before returning to Bayfront. The regular entry fee for the marathon, $80; the half-marathon, $60; and the 5K $25 is for the next six days discounted by 50 percent if mailed and postmarked by November 1st. The “Final Four” marathoners are excited to be entered in the 13th annual event. “This is my favorite marathon course in the state,” Kuramoto said. Kuramoto enjoys sharing the aloha spirit with others and has made numerous friends while doing the race. “My greatest feeling of accomplishment lately hasn’t been in crossing the finish line but rather who I have been training with that matters,” she said. “I love to see people return to Hilo to do the BIIM. It’s great that we have a beautiful course and that it is right in my backyard. The volunteers, behind the scenes, and the many people that come out to cheer us on has been wonderful,” Kuramoto said. Kuramoto completed her 65th marathon while on Kauai where she placed in her 60 to 64 age division. For both the Kona and BIIM Kuramoto holds the age group records as she continues to demonstrate that when it comes to running marathons, age doesn’t matter. Besides being a good distance runner Kuramoto also supports the sport for younger runners as she is sponsoring the entry fees for two University of Hawaii runners and continues to pay the entry fees for two Waiakea High School student runners. Hammes, an Economics Professor at the University of Hawaii at Hilo, just completed his 36 marathon when he traveled to Corning, New York to do the Wineglass Marathon. Hammes, who sits on the BIIM Board of Directors and serves as their treasurer, enjoys running the 26.2 mile race in Hilo each year. One thing the “final four” runners all have in common is their love for the sport of running as they share their aloha with others. “It is always fun to run it (BIIM) and then speak with the first timers who bring fresh eyes and experiences to the run,” Hammes said. Time is running out on getting 50 percent off on any of the three races hosted by BIIM on March 21, 2010. For more information go to www.hilomarathon.org or call 969-7400. Nice photo! The shirts photograph really well, good color choice!